A study published recently in the journal Nature Astronomy and which questions current models of structure formation in the universe is based on data obtained with the Gran Telescopio Canarias and among its authors is a team of researchers from the Instituto de Astrofísica de Canarias (IAC). The structure of the universe can be compared to that of a sponge, often referred to as the cosmic web. Matter is concentrated along filaments which cross over each other, forming zones where most matter accumulates, and others where there is very little. At the densest points, galaxies group together, forming clusters. These systems, which can contain thousands of galaxies, are the most massive structures in the universe. Studying the cosmic web is one of the current challenges in astrophysics. The properties of the main components of matter on these scales are not well known, so we use terms such as "dark matter" and "dark energy" The former makes up around 20 percent of the mass of the universe and is what keeps the structures bound by their own gravity—it acts a bit like glue. The second, on the other hand, makes up 75 percent of the universe and is related to the way in which the universe expands. The "normal" matter, the galaxies with their stars, gas, and dust, make up barely 5 percent of the mass of the universe, but they play the important role in tracing the forces and the properties of the dark matter and dark energies. 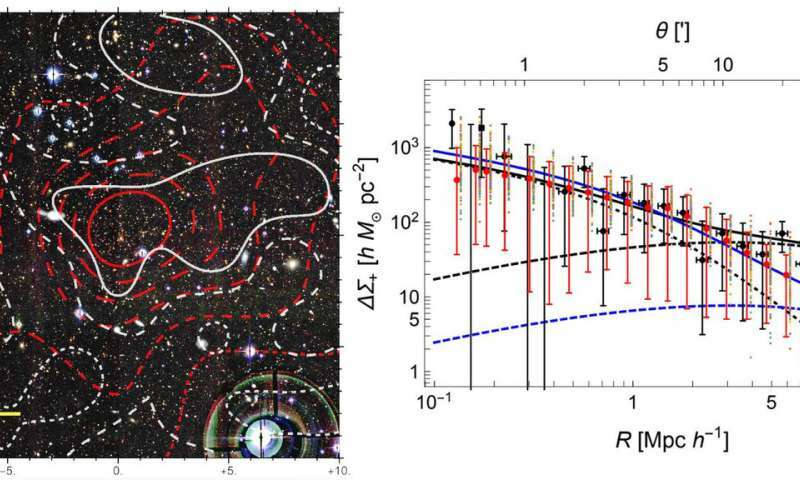 An international team led by Mauro Sereno of the University of Bologna (Italy), with participation by the IAC and by the Instituto de Astrofísica de Andalucía (IAA), has located one of the densest clusters of galaxies in the universe. The study analyses, for the first time, the outer zones of the galaxy cluster PSZ2 G099.86+58.45 out to a radius of 90 million light years, a region in which the distribution of matter was not known previously, nor whether the material in these zones is bound together by the gravity of the cluster. The environment of the clusters of galaxies includes other structures such as the filaments and other neighbouring clusters, and the material which is falling toward the most massive central cluster. "This study shows that the density of matter around the cluster we studied is up to six times greater than expected," says Mauro Sereno, the principal investigator. In addition, the researchers have discovered that the mechanisms which accrete mass can give rise to very high densities, even at large distances from these clusters of galaxies. The work is based on the "gravitational lens" effect, which happens when the mass of a cluster and its surrounding material bend the light from very distant galaxies, changing the shapes of the images of these background galaxies. The denser and more concentrated the body acting as a lens, the greater is the deformation of the background galaxies. The statistical study of the deformations for over 150,000 background galaxies via the so-called "weak lensing" effect using deep images obtained with the CFHT (Canada-France-Hawaii Telescope) have enabled the team to find the distribution, mass, and density around the cluster PSZ2 G099.86+58.45. The results show that this cluster is a rare exception, which does not fit well with the models of structure formation. This implies that there must be mechanisms for accreting matter that are much more efficient than those we know. Although the models give good fits to the density of the matter in the inner regions of galaxy clusters out to a distance of 15 to 20 million light years, in the outer regions, the models need an additional component to fit the observed data. " This component of mass is completely unknown, and the numerical simulations of galaxy clusters do not predict it," explains Rafael Barrena, an IAC researcher,one of the authors of the article published in Nature Astronomy." So we are faced with observational evidence for large quantities of matter where we did not expect to find it." The IAC group participating in this publication has made spectroscopic observations of a sample of galaxies that form a part of the PSZ2 G099.86+58.45 cluster using the multiobject OSIRIS spectrograph on the Gran Telescopio Canaris (GTC) at the Roque de los Muchachos Observatory (Garafía, La Palma). By measuring the velocities of the motions of the galaxies in the cluster it is possible to measure its total mass. As a practical problem, this is equivalent to measuring the mass of the sun by using the velocities of the planets in their orbits. Using this method, they have managed to measure the total mass of the cluster. The results confirm that PSZ2 G099.86+58.45 is a very massive, dense cluster of galaxies, and that the effects of its very powerful gravitational field extend to distances very far from its centre, much greater than the models predict. "We have produced a study that opens the door to a region of the universe that has been insufficiently explored until now, the boundary between clusters of galaxies," says the IAC researcher Alina Streblyanska, one of the authors of the article. This is a region that can give us a lot of information when we study these systems, how they formed, and how these, the most massive structures in the universe, have evolved. With this study, we have taken another small step toward understanding dark matter and how it is distributed in the cosmic web of the universe," concludes Antonio Ferragamo, IAC researcher.